All frames are .1 seconds apart. In this race, Susan O'Neill recorded a time of 1:58.24 seconds, a time that was slower than her winning time at the 2000 Australian Olympic Trials. Frame #1: The left arm is at mid-pull. The hand/forearm propelling-surface is developing maximum drag while powered by upper arm adduction. Frame #2: Left arm adduction is nearly complete with the propelling surface still at approximately right angles to the direction of propulsion. The right arm has entered long in front of the right shoulder. The left leg drags in the water after an abbreviated downward movement. It is not a kick. The exact purpose of the action is not clear. Frame #3: The left arm extends back with the hand still pushing while the forearm's effectiveness is progressively reduced by the decrease in its angle relative to the line of propulsion. The right arm presses down and the left leg kicks to counterbalance the entry's vertical force component. Streamline is good, but could be improved slightly if the swimmer looked directly toward the pool bottom. Frame #4: The right arm entry continues to press down and long forward. This is an error made by many swimmers, including champions. The white turbulence flowing off the back of the arm and hand indicates this movement creates drag resistance, which actually contributes to the slowing of the swimmer. What should have been performed here is that which occurs with the left arm entry. Rather than reach forward and deep, the hand/forearm should have been repositioned so that it could create the most effective pull possible. Frame #5: The right arm still presses down. Vertical forces produced by the recovering left arm counterbalance the vertical forces created by the right arm "press." It is impossible to tell if all these vertical force productions are a result of the pull or the recovery. The right arm is adducting with the hand/forearm not in a position to create effective propulsive forces. Frame #6: The right arm goes deeper still but is finally in a position where propulsive forces, that is, horizontal force components, are produced. Much potential for strong propulsion, powered mainly by upper arm adduction, has been lost. Frame #7: A deep, long arm-sweep backward is performed. This is not a particularly strong action. If the arm were bent more at the elbow, the force created would be greater and more direct. Another problem with this position is that in the ensuing latter stage of the stroke, the propelling surface of the arm will have to slide a long way upward, instead of continuing developing horizontal propulsion as was demonstrated with the left arm in the first few frames of this analysis. Frame #8: Right arm adduction is completed. With deep arm pulls, effective adduction is shortened backward -- another disadvantage of this form of stroking. The right elbow bends as the hand starts to move as much upward as it does backward. The right leg drags in the water after an abbreviated downward movement. It is not a kick. The exact purpose of this action is not clear. It replicates the same action performed by the left leg in frame #2. Frame #9: The right hand/forearm slows slightly because the elbow bends as the upper arm is elevated. The right arm is extended and the hand rotated outward. The left leg begins to kick in anticipation of having to counterbalance the right arm downward press or reposition and the exiting right arm. Frame #10: No propulsive forces are created in this frame. The right leg prepares to kick. Frame #11: The left arm begins to bend at the wrist and elbow. The left leg bends higher. The extra drag resistance created by this exaggerated kicking action can be seen by the milky turbulence following it. Frame #12: The left arm is being repositioned to achieve an "elbow-up" position. The left shoulder extends fully forward, the upper arm medially rotates (note how high the elbow still is in the stroking pattern), and the hand/forearm propelling-surface is slightly more than 45 degrees toward vertical. The left leg performs an abbreviated downward movement, possibly to assist in raising the left hip. Frame #13: Left arm propulsion is performed very well. It is powered by rapid upper arm adduction; the hand/forearm propelling-surface is almost at right angles to the line of intended projection, and the elbow is well bent to produce substantial power and to contribute to the directness of the propulsion. The right leg begins to kick. Frame #14: Left arm propulsion continues. Upper arm adduction has been particularly rapid. The position demonstrated in frame #1 is repeated. The head rotates to the left as the breathing action is initiated. The high left leg kick increases drag resistance. Frame #15 through #17: Actions similar to those in the early frames are repeated while the swimmer turns to the side to breathe. The swimmer in the background demonstrates the ill-advised action of reaching forward and downward after entry. The drag turbulence of her arm is visible for a long time and is detrimental to forward progression. Susan O'Neill only exhibits this fault with her right arm. 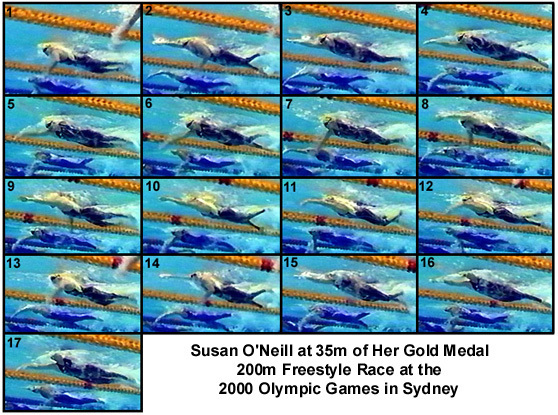 Susan O'Neill does not exhibit any strong swimming features that set her apart from other swimmers. Her excessively high kicking, and it is not known whether this is important or just a learned exaggeration, increases detrimental drag. Her left arm pull does achieve a high-elbow position, but not as early as some of the male swimmers featured on this web site.